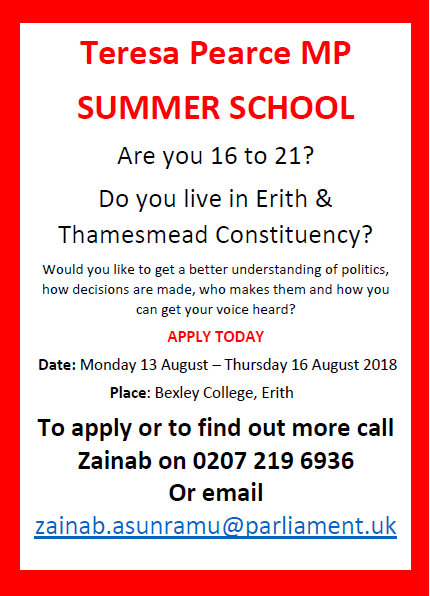 Teresa Pearce MP is holding a Summer School for young people between the ages of 16-21 who live in the Erith and Thamesmead constituency. The aim is to give people an understanding of how the decisions that affect our daily lives are made and who makes those decisions. We will also look at civic engagement and how a campaign could change a situation to influence law makers and affect society. We will also touch on how young people can get their voices heard and get involved in national and local politics. Selected students will learn how to develop key skills for future involvement in community based work as well as key campaigning skills and tools. 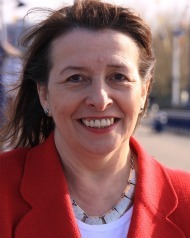 Sessions will be delivered on community development, campaigning, politics and communication. Please submit the personal statement along with your address to zainab.asunramu@parliament.uk. If you have any questions, please feel free to contact Zainab on the email address above or via telephone on 0207 219 6936. This entry was posted in Education, Events, Local events and tagged civil society, Education, politcal engagement, Summer school, your voice, youth and politics. Bookmark the permalink.